It’s that time of year again—new year’s resolutions. Don’t forget to take stock of your environmental impact as you are evaluating your life choices. I’ve made a simple list with some ideas for you. Hopefully you are doing some already. I certainly am not doing all of these yet, but maybe one day! Start reading the labels on your food. If the ingredients you find listed there don’t make you lose your appetite, good for you. I find the more I read labels, the less likely I am to buy anything but real, whole food like fresh fruits and veggies. Start reading books. Knowledge is half the battle. Start with Animal, Vegetable, Miracle or The Omnivore’s Dilemma. These are basic primers that should be required reading in every household. Log your chemicals. For one day, make a list of all the chemicals that are going in and on your body—toothpaste, soap, shampoo, laundry detergents, household cleaners…. Then start eliminating those that you can and replacing them with natural alternatives. Get to know your neighbors. Strong communities and connections to others are an important part of a sustainable life. Adjust your thermostat. Keep your house cooler in the winter and warmer in the summer. I keep my house at 55 in the winter and 85 in the summer. It may sound shockingly unbearable, but you would be surprised how fast your body adjusts. You’ll also be happy when your electric bill comes in, I promise. You might not have to go to such extremes, just try it a degree or two in the right direction and see how it feels. Salvage for your next building project. Yes, it may be easier to head to Home Depot and get all your building supplies in one place. But you’ll save money by salvaging some of what you need. Try Craigslist, your local Habitat for Humanity Restore, or Freecycle. Even better—ask your neighbors! Who knows what materials might be sitting behind someone’s garage just wasting away? Bonus points for building relationships with the folks in your neighborhood in the process. Switch to reusable grocery bags when you shop. While many of us have made the change, I’m still surprised at all the folks that haven’t. We all have off days where we forget, but this is such a quick, easy way to eliminate waste! Buy second hand… everything. Not just for the hipsters or the financially challenged anymore, your local thrift store, Craigslist, or eBay are where it’s at for environmentally-friendly shopping. Try substituting healthy, local sweeteners—like sorghum or honey—for sugar when you bake. Want a place to start? Try these recipes from Rough Draft Farmstead for homemade oreos or cinnamon donuts. Quit using paper towels. Raised in a house devoid of paper towels, I have always been sort of amazed that people find the disposable income in their budgets for something so… well, disposable. Not to mention the extra trash created. Get some backyard chickens. Or buy eggs from a neighbor who already has them! My favorite book on the topic is the Small Scale Poultry Flock by Harvey Ussery. Start composting. This might seem like a resolution to start in the spring, but it isn’t. You can begin right now by building a worm compost bin. You won’t regret it! Downsize. Smaller car, smaller house, smaller job? By making your life downwardly mobile, you will leave more room in it for the things that really matter. Line dry your clothes. You don’t have to do it every load, every time, but try doing it once a week or just on days with great weather. Besides saving electricity, I find the repetition sort of therapeutic. Skip a traditional Christmas. 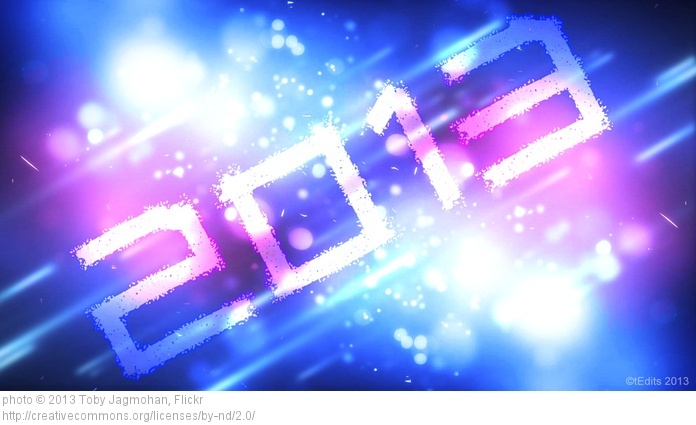 Start planning now for a meaningful holiday in 2013 that doesn’t include buying overpriced electronics, giving gifts no one really wants, excessive stress, and/or trampling anyone to death outside your local shopping mall. By thinking about the changes (and discussing it with your family) in advance, you can plan ahead to do something different and start making Christmas traditions that truly matter. Join Community Farm Alliance. I hope you are supporting the work of Kentucky’s small farmers! These are the people who will save the world. Buy meat produced from animals that have been treated humanely. Better for the animals, better for the farmer, better for you, better for the planet. It may cost more and take more effort to know your farmer and their animal husbandry practices, but it is worth every bit of the hassle. Share the good news. Tell the people in your life that matter why you care about the earth and how the changes you’ve made have improved your life! Helping others discover this way of life is a huge step in building healthy, sustainable communities that will last. Visit a farm. So many farms are offering farm tours these days. Visiting will put you in touch with your agricultural roots. If you have kids, I feel like this is even more important. Early exposure to farm life gives them a different appreciation for the food on their plate! Switch to CFL bulbs if you still haven’t made the leap—or even better, invest in LEDs! Start a sustainable group. It may sound silly, but sometimes being the only treehugger, hippie, wannabe-Amish homesteader in the neighborhood can make you feel a little lonely. Find some like-minded friends and get together every few months to swap ideas, seeds, home brew, and back issues of Mother Earth News. Join a CSA. There are too many in Kentucky to list—check Local Harvest to find one in your area. Find a better source for your imported goods. Let’s face it, only the saintliest of us are eating 100% local, 100% of the time. Once you’ve eliminated all but the most important imports, what do you do? Research where things like chocolate, olive oil, coffee, or tea come from and try to buy the best versions, both for your physical health and that of the planet. It might mean splurging on organic or fair trade or even finding a small farmer who sells directly to consumers online. Plant a garden. Ya’ll, even if all you can manage is one plant, nothing else can give you the same appreciation for where your food comes from. Try homeopathic remedies first before heading to the doctor. Share a meal with someone in need. Have you ever noticed how once you are in the kitchen cooking, it is very little hassle to prepare just a little extra for someone else? Perhaps no person who might be hungry immediately comes to mind, but sometimes sharing a meal can meet an emotional need just as much as a physical one. Also, cooking great, healthy food for someone can help open their eyes to a world outside of processed food! Read Wendell Berry’s “Manifesto: The Mad Farmer Liberation Front.” Maybe read it every day. Hang it on the wall. Tattoo your favorite line on your arm… just kidding. Sort of. Hunt and eat wild game. There’s nothing more organic or local, plus the money from your hunting license goes to support conservation across the state. Take a farm-cation. Visit WWOOFUSA for the opportunity to stay around the country and world at organic farms (though we are personally partial to Kentucky farms). Work a few hours a day in exchange for your lodging and learn important farming skills in the process. Take a staycation. Not just for saving money—great for the environment, too! Take shorter showers and less of them. Visit a national park. Be sure to pick up any litter while you’re there! Volunteer to help your church, school, or civic organization go green. 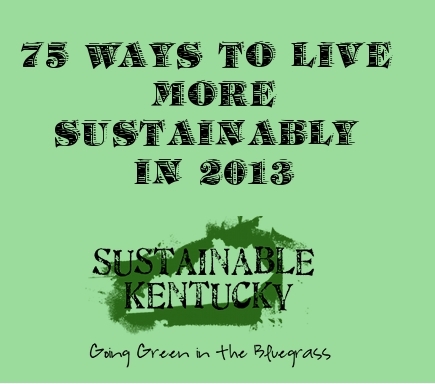 Kentucky-based non-profit Blessed Earth has some great resources for this! Switch your printer to double-sided printing. Glean. Check out what Lexington organization Faith Feeds is doing to gather food from farms and farmers markets to feed the hungry and try to do something similar in your hometown! Come to I Love Mountains Day in Frankfort on February 14th. Learn to can, freeze, and dry food. Learning to preserve food, even in the smallest batches, can be a huge savings for your food budget and keep you from relying so much on grocery store foods. I personally have benefited from The Big Book of Preserving the Harvest. Join a co-op. Some of us in small towns don’t have this luxury, but many do. In Lexington, please visit my friends at Good Food Co-op, and in Louisville, while it isn’t technically a co-op, Grasshoppers Distribution is all kinds of awesome. Get a rain barrel or two. Plan a green burial. If you’ve lived your entire life simply and sustainably, do you really want to be buried in a useless box stuffed with toxic chemicals when the time comes? Share your knowledge with someone else. Teach a friend to cook, to garden, or to shop sustainably. Quit getting catalogs. Besides the wasted paper, there’s the added temptation to buy things, possibly produced in foreign countries with unfavorable working conditions for the people making the stuff you don’t need. Visit your local farmers market in the rain. Even if you aren’t a regular customer, go on a day when the weather looks particularly nasty. I guarantee the farmers will want to hug you and will probably give you a good deal for your trouble. Save heirloom seeds. Invest in the genetic diversity of our food supply. Convert your lawn to food production. Become a minimalist. Buying less stuff means you are contributing less to the consumer/waste cycle. Become a nudist. Less clothes purchased from sweatshops, less energy and water wasted on laundry, less chemical exposure on your body, and more vitamin D, too. Buy sustainable seafood. If you are looking for salmon, I can’t recommend the wild-caught kind from Kentuckians Jason and Mary Beth McKinley enough! Make and eat more fermented foods. Read The Art of Fermentation by Sandor Katz or our own fermentation series here on the blog written by Jesse Frost. Quit taking the elevators. If you think about it, the stairs are sort of solar-powered anyway. Ask for local food. Hiring a caterer for an event? Ask them to source the food locally. When they say it’s impossible or too expensive, ask again and provide them viable options to lower the cost—like serving more vegetables. Ask your favorite small restaurants to start sourcing from local farmers. Ask your local grocer or health food store to stock meats, veggies, and eggs from nearby farmers. If at first you don’t succeed, ask again. Get really dirty. Work in the garden, do some landscaping, dig a hole recreationally. Haven’t you heard dirt is the new Prozac? Combine that with a little sunshine and you’ve got a recipe for a healthier, more sustainable life without spending a dime or exerting too much effort. Learn to forage wild edibles. Wash your clothes less… and always in cold water. Bring your own reusable takeout containers when you eat out. Have a green wedding. Even better, elope. Avoid buying things packaged in styrofoam or plastic. Vote for candidates who have a good record with environmental concerns. Watch a green documentary for inspiration. Might I recommend Y.E.R.T., a film that has some Kentucky ties? Eat organic foods. While you may not choose to eat everything organic, at least choose to buy organic when it comes to the foods that require the most pesticides to grow. Reduce, reuse, recycle. Perhaps the oldest trick in the book, but sometimes it helps to be reminded, doesn’t it? Shop local. Swear off the box stores when you can and put your dollars in your independent, locally-owned retailers who are more invested in your community and will keep more of your money close to home. I liked it all…not to sure about becoming a nudist!! Nudism in Kentucky, too cold for that! I loved this! Most of which I do try to do on a regular basis however there are a number which I plan on working toward this year! I never pay more than $5 an outfit, dress clothes and frilly holiday dresses included! I just got my son 7 pair of jeans and 2 cargo khakis all for $8! Learn how to cut hair, not just with clippers! I haven’t paid for a haircut or style more than twice in 20 years! I like long but it gets annoying so every few years I hack it off and mail it to locks of love. My oldest does the same now too! My boys alternate between buzz cuts, Mohawks and the shaggy on top styles and I can style a girls hair including my own anyway you want! The only class I ever remotely took was a braiding one where I was the model at 6 years old. Give up makeup too! Or as much as you can stand too. And try to find a natural alternative for the stuff you want to keep. I used to do the whole nine yards and now I just mascara and lipgloss. I have less breakouts now too. I am starting to expirement with mascara alternatives too. Shop with a friend and take 1 vehicle! I love the days where hubs takes the kids so that 2 of my girl friends and my brother can go grocery shopping! I take the back row of seats out of my van, throw in an empty cooler and my reusable bags and enjoy a day of shopping. I do store hop so splitting gas costs 4 ways and having friends around is fantastic! We split deals this way too. These trips are a 1 month shopping trip ( minus fresh food bought in between) so we are able to buy bulk and split up the costs. I have saved as much as $300 with this alone! Choose gifts that last and consider a group gift. I have 4 kids that gets expensive at holidays. We always do a big family gift. Usually a membership for the zoo. It lasts all year and the kids enjoy being able to go often and take our time without rushing to see it all in one trip. Somedays they don’t make it out of the play area! Be proactive about your health! I made 2 small changes this year and we have not caught a single cold or flu in our family. My kids are in public school and we have had many people around us hacking and snoting everywhere and not so much a sniffles here! Not bad for a family full of asthmatics during cold & flu season! We all drink a cup of tea with 3 tablespoons of honey a day and we added more vitamin D to our diets and a supplement. Vitamin D helps your immune system and during cold season people aren’t outside as much soaking up the sun and vit D!!! Usually by now we are tag teaming the ER and going to the pediatrician several times a week. We do NOT get a flu shot either!!!!!!!! Split your meat with another family. Here (PA) it is cheapest if I buy a whole cow…. Where am I going to store a whole cow?!? I store a quarter and 3 of my friends do too! This gives us great quality meat, gives our business to a small local farmer and we save hundreds! Oh sooooo many good ideas here in this list! I’m excited to try a few! I have 2 black thumbs so this ought to be interesting!!!! Please, please please change this post to remove the CFL bulb and simply just have LED bulbs. CFL bulbs contain mercury and are incredibly dangerous to people if they break and the environment when they’re burnt out. What’s up i am kavin, its my first occasion to commenting anywhere, when i read this piece of writing i thought i could also make comment due to this sensible paragraph. Make sure you’ve checked search funnel attribution for assists before you delete keywords. is expanding andand looking lush and green.